Originally, Delta County included land from a number of other counties which gave it a triangle shape. Thus, the name "delta" after the Greek letter was given due to the similar shapes in both. While the border later changed, effectively altering the overall shape of the county, the name remained the same. Vital records for Delta County begin a few years after the county was organized in 1861; marriage and divorce, as well as birth and death records are all available from 1867 to the present. Up to two researchers or genealogists are allowed at the same time due to the limited research space in the office, which is located at 310 Ludington Street in Escanaba, MI. 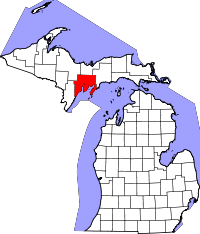 The town of Escanaba, which is the Delta County Seat, is named for the Escanaba River which flows throughout the county and is a popular fishing and boating area in the region.